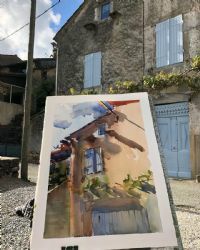 Paul is a plein air artist, working mainly in oils, with some urban sketching in watercolours. He normally paints outdoors and in his own words, says “Studio painting is fun. But plein air painting is exhilarating.” Paul admits that here in Northern Ireland, the weather is a challenge. You need to wrap up well as it will rain often! He paints rapidly and ‘from the gut’. His work is semi-abstract with the essence of a scene filtered through his guiding principals of composition, colour, tone, line and intuition.